Spring is almost here. Are you ready for the bumblebees, butterflies, and birds to dance about your backyard? Now is the time to start planning for some outdoor fun for the kids, too. Why not beautify the garden while you’re at it? Look around your house and begin to think outside the box for ways to reuse your unwanted knickknacks or cracked plates in the garden. With these quick and easy D.I.Y. projects, you can keep the kids smiling as the snow melts and spring arrives. One of the most exciting trends of 2019 is reducing water waste with drought-resistant plants and fun rock gardens. One of my favourite DIY garden projects is to create a rock garden that can be brought indoors when the weather turns frigid. You can start this inside now and bring it outdoors when the weather warms back up. I recommend using succulents because they’re easy to care for and can handle the kids petting their leaves and playing with them. They also propagate easily which can be another learning project for next year. Start with a container. This is where you have options. If you have a container you’d like to use lying around the house, don’t hesitate to turn it into a fun and funky planter. Some unique ideas include a scratched baking pan or even a cracked teapot. Fill the container about 2/3rds full with potting soil or whatever mix works best for the flowers you’ve selected. Succulents often do best in containers with sandy soil that drains quickly. Now, arrange your plants so they have some space to spread a bit. Remember to think contrast when it comes to size, shape, and color. If you have any porcelain figurines, you can add them now, too. Loosen their roots so your plants have the best chances. Kids usually love doing this part because it gives them the opportunity to get a little dirty. Add another inch or three around the roots and place your stones gently on top of the soil. A rock garden doesn’t require much water, but the plants will require sun. So, place your rock garden on a windowsill or somewhere sunny. You and the kids can also add crystals or clay creations to give your rock garden more character. Once it warms up, bring you planter outside and watch your plants soak in the sun. After you’ve planted your winter containers and organized your seeds, what can you do next? As you ready your family for planting some fruits, veggies, and flowers in the garden, you can prepare some bespoke plant markers to the place where your seeds will sprout. This will keep the kid’s hands busy while the soil thaws. This project is perfect for helping you plan what you want to harvest this year, too. Decide what plants you want. You can time when your flowers bloom and when your veggies will be mature. I like to cycle my flowers for late spring to fall blooms. Find a set of items you no longer have a use for. Get creative. You can use forks and spoons for your veggies or old action figures. It’s really up to you and the little ones what kind of flair you want your garden to have. Let the kids practice their writing or drawing skills. Use a fine-tipped permanent marker to write the names of the plants on small scraps of paper. Torn edges can give these tags a fun look. Little kids also have a blast if you let them name the plants. Who doesn’t want a cactus named Fred? Place the paper over the plant markers and affix them with Modge Podge. Let them dry overnight. In light strokes, spray a sealer over the paper so it will stay on all spring, summer, and fall. Keep them somewhere safe so when spring is here you can pop them into the ground beside your freshly planted flowers. When it comes to gardening on a budget. D.I.Y. projects are perfect! They will keep the kids from going stir crazy and give your garden a fresh and fun look. This also makes a perfect project to leave with the babysitter or nanny. 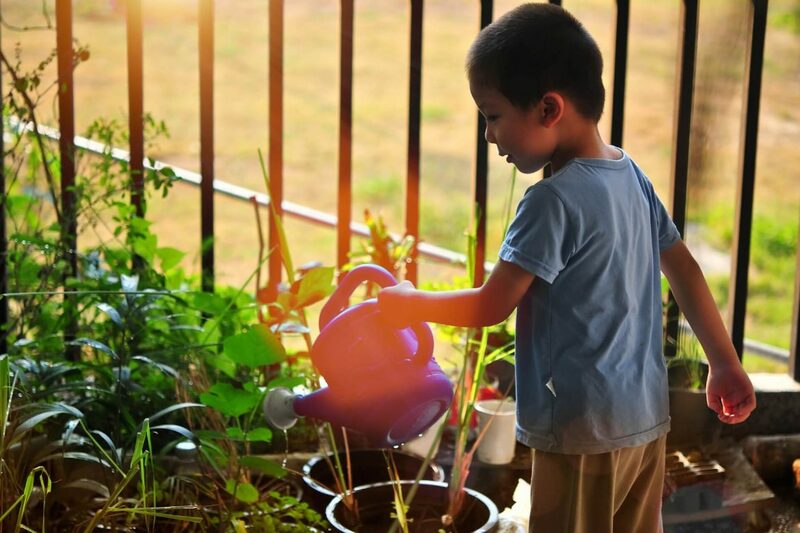 Help your kids develop green thumbs while reducing waste. A vegetable garden will also encourage your little ones while teaching them about the natural world. Most importantly, have fun while you wait for spring to arrive! I’ve been looking forward to reading The Trap since I came across it in the charity shop. I looked it up on Goodreads and saw that it’s not very highly rated, but I decided not to read any of the reviews as I wanted to make my own mind up. In this twisted debut thriller, a reclusive author sets the perfect trap for her sister’s murderer–but is he really the killer? For 11 years, the bestselling author Linda Conrads has mystified fans by never setting foot outside her home. Haunted by the unsolved murder of her younger sister–who she discovered in a pool of blood–and the face of the man she saw fleeing the scene, Linda’s hermit existence helps her cope with debilitating anxiety. But the sanctity of her oasis is shattered when she sees her sister’s murderer on television. Hobbled by years of isolation, Linda resolves to use the plot of her next novel to lay an irresistible trap for the man. As the plan is set in motion and the past comes rushing back, Linda’s memories–and her very sanity–are called into question. Is this man a heartless killer or merely a helpless victim? I really enjoyed The Trap. It kept me reading because I just had to know if Linda was right about Lenzen or whether all the years she’s spent as a recluse since her sister’s murder had messed with her mind. I liked the way the chapters alternated between the book Linda had written about the murder and back to Linda in the present day.